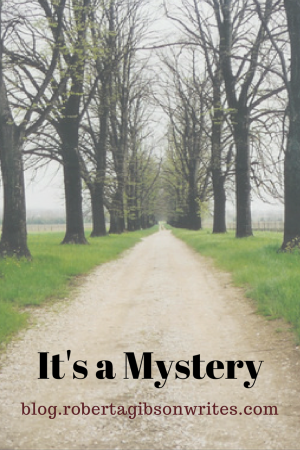 Is your blog is disarray? Schedule lagging, to-dos building up, or feeling unorganized? 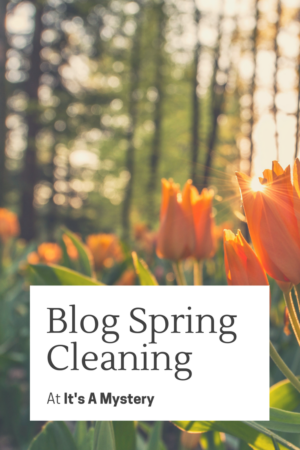 Then join the Spring 2018 Bloggiesta from March 19-25 and tidy up your blog! 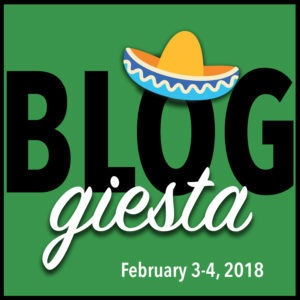 Bloggiesta is an online party where you can find blog organization tips, take challenges to learn new things, and — best of all — meet some awesome bloggers! If you are interested, post a to-do list like the one below and then link to the Spring Sign Up page. There is also more information to explore at the Bloggiesta blog. 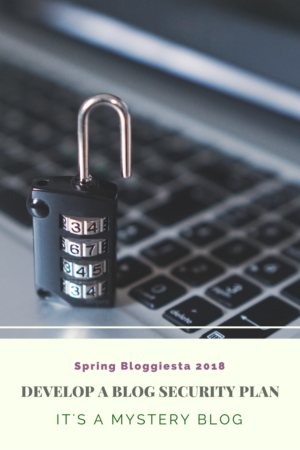 Create a mini-challenge about blog security and post it. Blog security mini-challenge now posted. Update the Bestseller Code 100 Reading Challenge Book List into October. Participate in a Twitter party, particularly the one(s) on organization – well, I did go read the #bloggiesta hashtag on Twitter this morning. Cross-post some reviews to GoodReads, etc. -This one will have to be done later. Visit and comment on other Bloggiesta participants’ blogs If you didn’t see a comment from me either I couldn’t find your Bloggiesta post or for some reason I couldn’t post a comment. I did try. Chapters and Charms suggested making some Tumblr-specific posts for Tumblr, which is an excellent idea I will blatantly steal and use for the next Bloggiesta. Exploring new social media platforms: I’ve noticed several bloggers have social media buttons that either I didn’t know you could have or have never heard of. I need to find out more. Read X number of books and organize when to review each on a calendar. If you’re interested, I will be pinning to my Bloggiesta Wisdom Pinterest Board throughout the week. 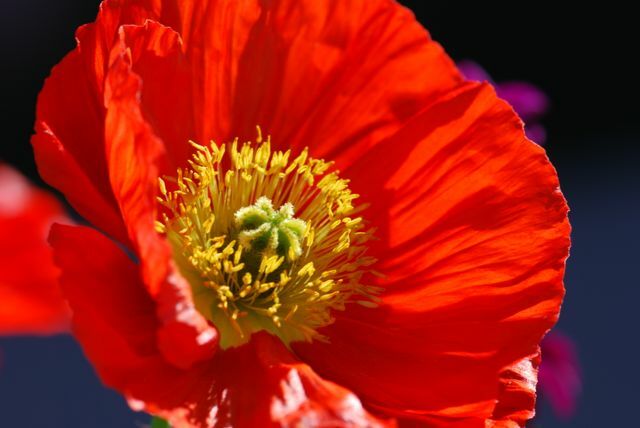 Hope you all have a fun and productive Bloggiesta. 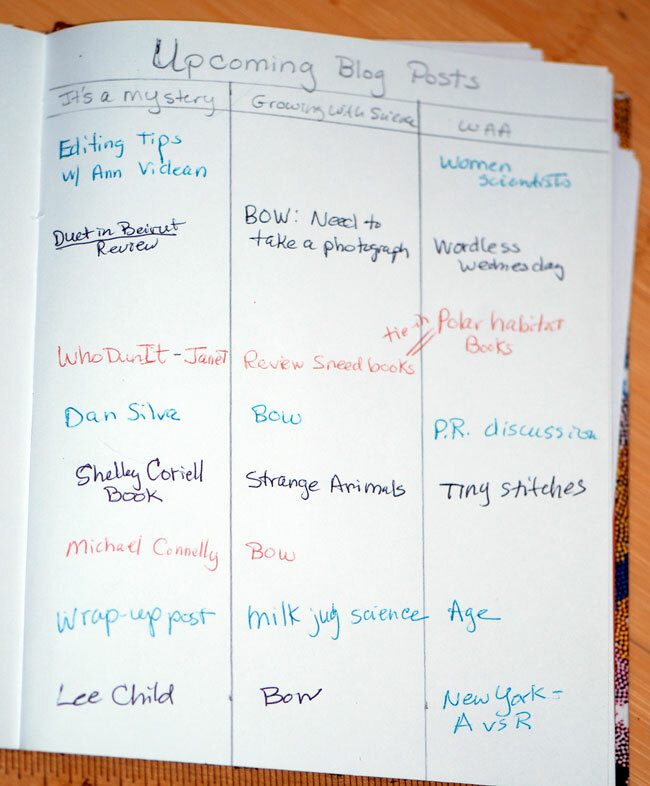 Andrea at The Overstuffed Bookcase has a wonderful mini-challenge for using a bullet journal to keep your blog organized. I’m afraid I had to rush through this one a bit, because I’m due at a birthday party shortly. I highly recommend heading over to Andrea’s blog and reading more about the potential of bullet journals. Okay, I admit I’m totally weird, but I have a lot of blogs so I keep track of upcoming posts in vertical columns. How it works is each column is a blog, and each row is a day of the week. This way I can see all the posts scheduled for a given day and how they flow within a given blog. Sometimes posts on two blogs tie together. Again, I was in a hurry, so it isn’t very neat and pretty. Hopefully you get the idea. 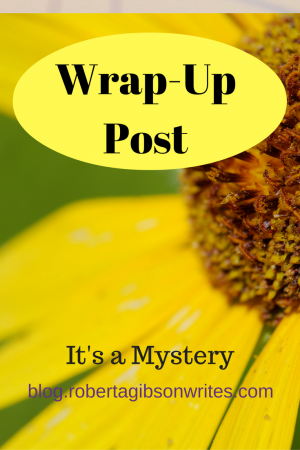 Jeanene at Got My Book blog has a Bloggiesta Mini-challenge to “Increase Readership & Engagement with a Wrap-up Post.” I’ve never done one before, so I decided to give it a try. Participated in Bloggiesta (to-do list and mini-challenge) Bloggiesta is a great way to tip you out of your blogging rut/comfort zone. I am currently reading some nonfiction books as research for my upcoming NaNo writing project. I’m also hosting the Writer’s Studio this week, so I have out some of my favorite books about the craft of writing, such as Natalie Goldberg’s Writing Down the Bones, and Stephen King’s On Writing. For fun, I have Sue Grafton’s T is for Trespass (Yes, I’m behind). 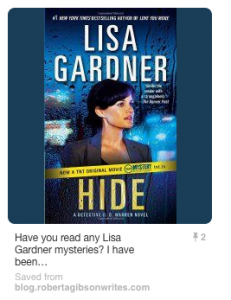 Mocha Girls Read has a great list of thrillers/suspense/mysteries to check out. 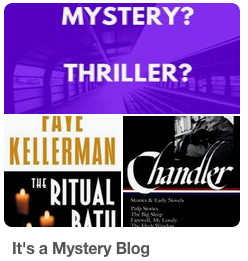 Oh, just found a list of new books coming out in all the different subgenres of suspense at View for My Books Blog. Wow, writing a wrap-up was actually fun. Jeanene suggests copying a template and starting the post at the beginning of the week, filling in links as you go. That sounds like a great idea! Do you have a blog, particularly a book blog? Time to tune it up and get energized by participating in the Fall 2016 Bloggiesta, running from September 15-18. 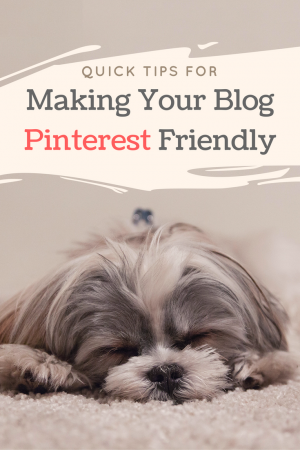 This year I’m excited to announce I will be hosting a mini challenge: Tips for making your blog Pinterest-friendly – Now live! ✅ 1. Fix the links in the early posts that broke when I moved to this domain. ✅ 2. Write two reviews and schedule them. Include Pinterest-ready images. 3. Prepare a video Whodunit Challenge (#5). 4. Post older reviews to Goodreads. 6. Figure out how to improve the link to RSS in the sidebar (so it doesn’t list a post?). ✅ 7. Add a contact page. ✅ 8. Memes are a great way to keep motivated and meet new people. I plan to go to the Master List of Book Blogging Memes and find one or two to join. Tried out The Sunday Post meme here. ✅ 9. Visit and comment on other Bloggiesta participants’ blogs. 10. Check out the mini challenges from previous years for even more ideas. 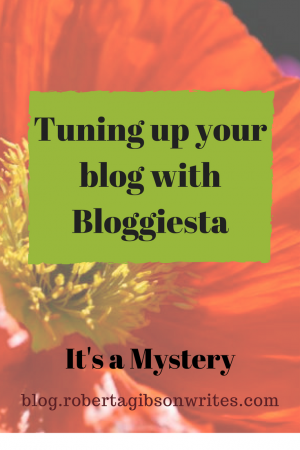 Are you participating in Bloggiesta this year? What is on your to do list?